Once, in Minecraft, I built a house. It was a good house, on a cliff. Over time, I added a farm, a mine and, far underground, my own personal gateway to a nightmarish hell dimension. It was nice. It felt like an achievement. 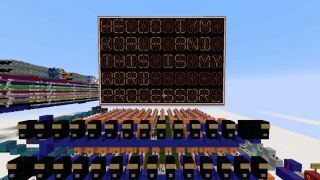 Anyway, here's a Minecraft player who—without the use of command blocks—has created a working word processor. That, it turns out, is also a thing you can do in Minecraft. "After almost 2 years working on this I finally have it finished," writes Koala_Steamed. The word processor can generate uppercase and lowercase letters, numbers and symbols. With no command blocks involved, it's all done the old-fashioned way: redstone. Lots of it. Yes, it's slow as molasses. But I think you can forgive that in a word processor that was made inside of a game. Koala_Steamed's next step is to turn the processor into a computer with an ALU and CPU. There's also talk of "adding RAM so that files can also be saved". I'm not entirely convinced that's a thing you can actually do, but then, I wasn't entirely convinced a word processor was either, so who even knows any more.